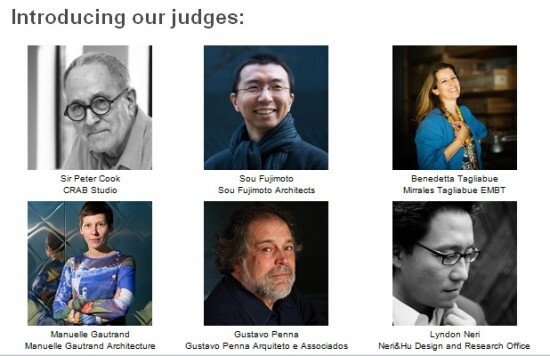 The WAF awards are unique and are the only awards to enter if you want to receive critical feedback in person from our international jurors. Several large-scale, eco-friendly projects at the intersection of landscape, architecture, and urbanism were honored at this year’s World Architecture Festival (WAF) in Singapore. 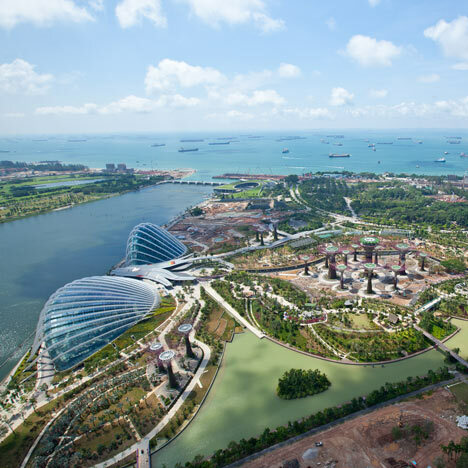 Building of the Year was awarded to London-based Wilkinson Eyre’s Gardens by the Bay (above), designed in collaboration with landscape architects Grant Associates in 2003 for a competition to develop a reclaimed 250-acre site adjacent to a marina in downtown Singapore. Among the other top honorees were AECOM's Heart of Doha Masterplan, winning Future Project of the Year, and Atelier Dreiseitl's Kallang River Bishan Park, which took Landscape Project of the Year. Gardens by the Bay wraps luscious public gardens, Mediterranean flowers, event spaces, and a 100-foot high man-made waterfall under two steel-and-glass dome-like structures, the largest climate controlled greenhouses in the world. 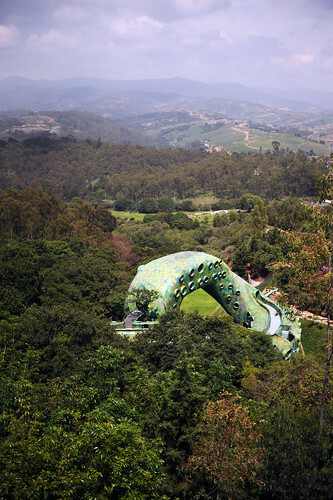 The whimsical scheme also includes eighteen 164-foot high “Supertree” structures holding thousands of exotic plant species and connected by a series of high-tech eco-bridges that collect and re-channel rainwater to cool themselves and the adjacent greenhouses. Gardens by the Bay was completed in 2012 and has been open to the public since June. WAF awarded Future Project of the Year to AECOM’s 77-acre Heart of Doha Masterplan in Qatar, designed as the gateway to Inner Doha and connecting the city with its waterfront as well as existing and proposed airports. 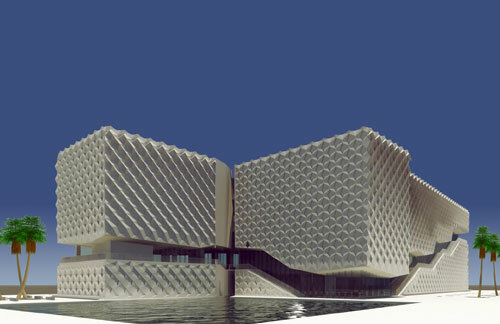 Referred to by the architects as “the grid and the lattice,” AECOM superimposed an orthogonal grid onto Doha’s traditional Qatari street pattern to create a new urban structure that respects the Arab/Islamic vernacular, captures north-westerly breezes, and accommodates vehicular traffic. The Landscape of the Year award went to landscape architects Atelier Dreiseitl for their Kallang River Bishan Park in Singapore, a project that transforms an existing, underused park and river into an ecological public space. 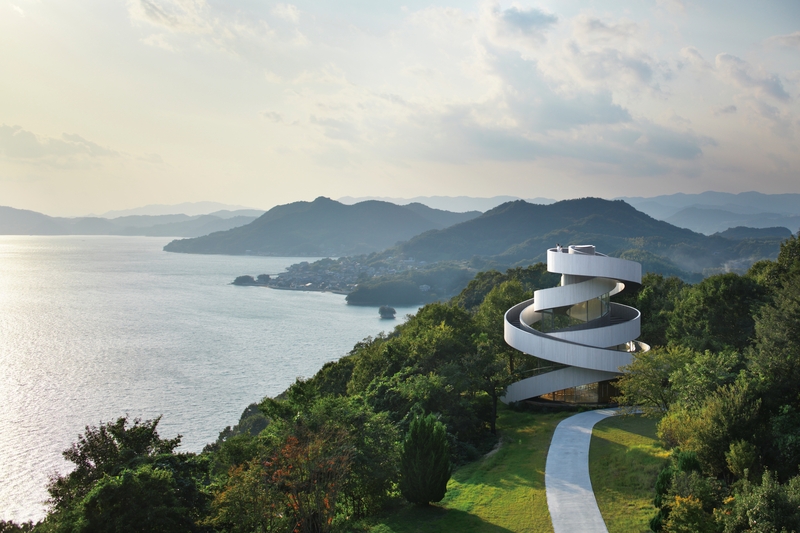 View all of this year's winners at the World Architecture Festival website. Click on a thumbnail below to launch a slideshow. A recent trip to Barcelona for the World Architecture Festival (WAF) made clear to me just how well the nations of the European Union do at updating their historic centers. American tourists, of course, go to places like Spain to see medieval or Renaissance urbanism not contemporary cities. And that’s a shame because we could learn a great deal about how to build today and add intelligently to our own 19th and 20th century cities. The WAF takes place in a totally new city near the 2004 Herzog and deMeuron-designed Barcelona Forum, but even in the old city the Richard Meier-designed Macba Museum boldly asserts itself in the medieval core. Down La Ramblas from the quarter where the white Macba sits is another contemporary museum, the Santa Monica Museum, which is a kunsthalle. 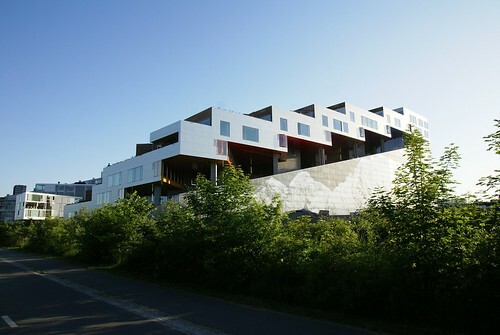 The museum does not collect art, but serves as a multidisciplinary center for art, science, thought, and communication. Even here Americans could learn a thing or two about contemporary culture, in this case, one of our favorites: television. The exhibition, "TV/Arts/TV" details the history of video art and includes all the pioneers of the movement including Dan Graham, Muntadas, Chris Marker, Gary Hill and Wolf Vostell. The exhibition is comprised almost entirely of spatially compelling installations that should be of interest to architects for its content and power to communicate with an audience. One piece, "From Receiver to Remote control... channeling Spain 2010", by New Yorkers Judith Barry and Ken Saylor with Project Projects, cork screwed through a dead end hallway with 91 photographs and 10 flat screens with audio that trace how television "transforms the social space of the home and family relations" (though the show closed on Saturday this piece has been extended through January). 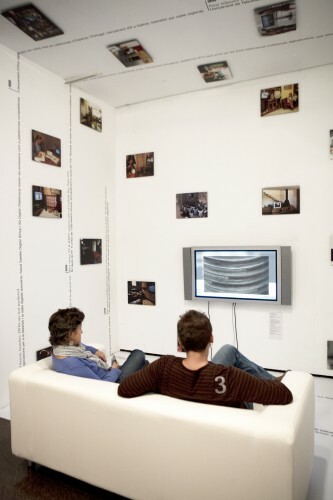 Based on an earlier version of the installation that focused on American television and the home, this piece compares some of the differences and similarities in television history between Spain and the U.S. in relationship to the 'participatory.' It makes the point that "while television is often considered a monolithic entity, it differs from culture to culture. Tele-visual space produces personal and collective identities across 'national' and global boundaries where the viewer is implicated in questions of how media is democratized" and invites spectator participation. The narrowness of the hallway exhibition space and the displays on all the surrounding surfaces envelope museum-goers bringing us literally inside television as much as when we view a TV screen from a comfy chair at home. With so many American artists involved, it's only a shame that I had to go Spain to see this thought-provoking work. I just finished my day of judging the Civic and Community session of the WAF in Barcelona. The festival competition is divided into sixteen categories, with each session winner going into a final round to determine the Building of the Year. My session’s jurors included the Japanese architect Sou Fujimoto and the Canadian (now living in London) Renato Benedetti, and we spent the day working our way through 14 entries, including the new British Embassy in Algiers by John McAslan + Partners, and a fine Mexican church and community center by Sordo Madaleno Arquitectos. In my mind, however, two projects stood out from the rest. 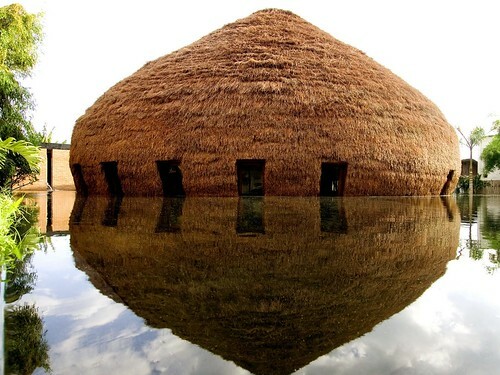 The first was a fantastic woolly-mammoth-like bar built of long arching bamboo poles and covered with what looked like palm fronds. But since the project, nWn Bar by Vo Trang Nghia Co., is a cafe and pub, we questioned the designers about how it fit into the theme of a civic or community building. The designers conferred, and then explained that they built a model of the project, which they donated to a community library; the bar is also “free to enter,” they said. That didn’t cut it, so we moved on to other projects. The second project I supported—and the one that was my favorite—was the Emergency Terminal in Zagreb, Croatia by Produkcija 004. It’s a civic building that, while not publicly accessible, serves as the headquarters for the city’s emergency response teams. It has car parking for ambulances, beds for workers, and, in case of national emergency, cold storage facilities for antibiotics and vaccines. The building itself is wrapped in a stretched polymer fabric that allows all the structure’s functions to be read on the facade, and is ablaze at night with fluorescent light. I really like the building, and helped push it through to the next round, but the jury decided to give special commendation to two small, exquisite projects: a wonderfully appropriate Reconstructionist Congregation synagogue in Evanston, Illinois by Ross Barney Architects and La Cisnera Community Center on the Spanish island of Tenerife by GPY Arquitectos. On my way out of the assembly hall to yet another drinks party, I ran into several journalists who confirmed the rumor that the two women in the running to direct the upcoming architecture biennale are indeed Kazuyo Sejima and New York’s own Liz Diller. Many are placing their money on Sejima to get the prize, but I am campaigning for our own Liz. Go Liz! World Arch Fest: Hola Barcelona! This week, the second World Architecture Festival is taking place in one of the most design-conscious cities in the world: Barcelona. 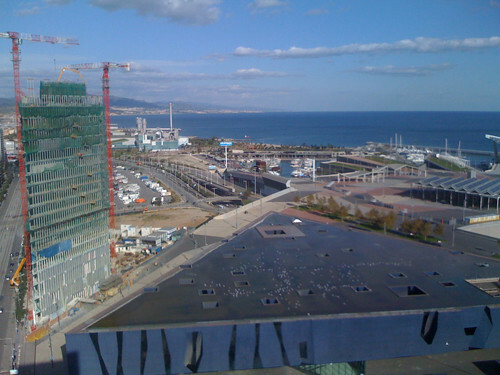 Sadly, the festival is located in the Diagonal Mar district on the city’s waterfront, along with the hotel that WAF sponsor emap provided to jurors (I am here serving on the jury for the festival’s Civic and Community award). At first glance, this entirely new district of the city seems to have more in common with Grand Rapids than the Catalonian capital. I mentioned this to a British colleague, who replied, “Are American cities this nice?” He’s right: We can’t even do modern urbanism better than the Europeans. The event started with a quick drinks reception and then dinner with WAF director extraordinaire Paul Finch and the dapper British architects Simon Allford and Paul Monaghan of Allford Hall Monaghan Morris. Paul suggested we eat at Els Pescadors in Placa Prim, an ancient plaza that has somehow escaped the modernization of this area of the city. An elegantly understated traditional eatery, with its salt cod in chili peppers, sliced ham from black-acorn-eating pigs, and squid noodles, it was a perfect place for conversation. Paul talked about his successful campaign to become head of Britain’s Commission for Architecture and the Built Environment, and we chatted about the rumor that the next director of the Venice Biennale will be a woman—and that the two names most often mentioned in the running are the leading female architects in New York and Tokyo. Getting back to American urbanism, Paul and Simon told of the shock of having to incorporate, in their first American project in Oklahoma, two parking spaces for every one-bedroom apartment, whereas in the U.K. requirements call for one space for every two flats. After multiple bottles of cava, vino tinto, and dessert wine (I was with three Brits, after all), I struggled back to my hotel to spend an hour drying out in the 13th-floor sauna with its extraordinary view of the Sagrada Familia. Tomorrow’s lineup: I judge my section of the festival, then have dinner with other jurors at the Barcelona Pavilion, then more drinks with the Brits. Oh, and celebrate the festival's many other winners, of course!